There’s no denying that in this day and age, technology has taken over a considerable portion of our lives. Aside from cellphones, the most prominent technology to have hit our generation is the Internet. Now information, news and even people are literally a google search away. 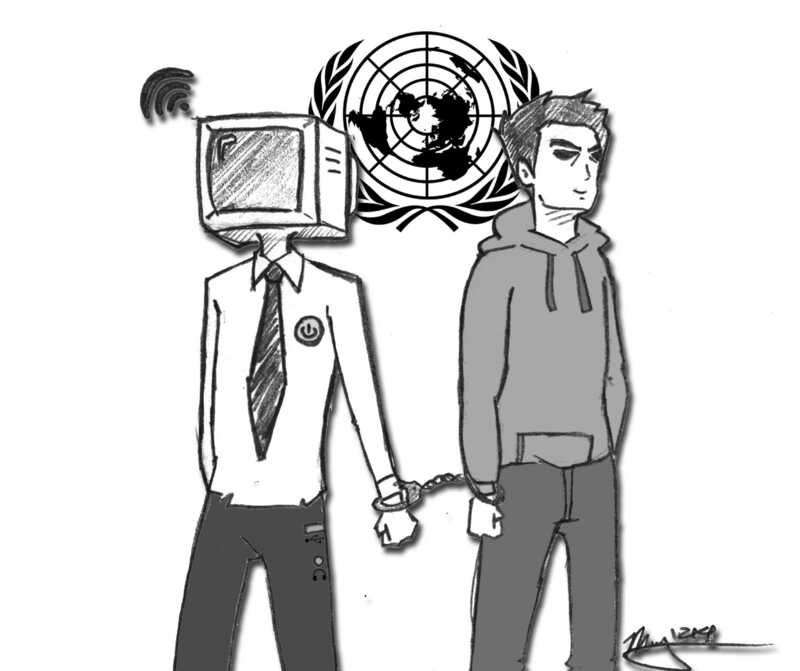 Back in 2011, the United Nations (UN) released a statement that said the UN has recognized that Internet access is a human right. We here at the Sundial believe that Internet access is as of now a privilege, since we have to pay to have access to the net. Given the precedence of the Internet, we believe that the internet should become a human right. Even so, there are some precautions to understand if we were to hand universal control of the Internet to a single power. To us Matadors, and even more so for those of us at the Sundial, the Internet has become an indispensable tool necessary to do almost all of our daily tasks. Whenever the Internet at school goes down, we freak out. From just perusing the Internet to using Google Documents to put together an essay for class, the Internet has surgically embedded itself into our daily lives. Many who live in this era can no longer imagine what life would be like without the Internet. Think about it. In developed nations, nearly everything is found or done online now. The Internet has become the new classifieds, as friends use social media to broadcast a job opening, or when job-seekers use Craigslist, Monster or the company site itself to search and apply for a job. These job searches more than likely lead us to an online application, a print-out of an application or the instructions to email a resume. But the Internet is more than just a gigantic classified ad. For college students, it’s become a necessity. Media convergence of the classrooms is taking place, as evidenced by the various myCSUNtablet classes, moodle and online classes. There’s no denying that the Internet and technology is taking our learning environment beyond the traditional classroom. Now, tests, quizzes and sometimes even finals are being facilitated through Moodle. Electronic submission of essays are commonplace, and emailing professors for help or to schedule office hours is often taken for granted. Not only that, but reminders and notifications are constantly sent to students through the use of the Internet. Applying for FAFSA now takes place online, as well as registering for our classes. Navigational apps on our smartphones have become common, as people will now say that they will just “navi it.” Now, reaching places we’ve never been to before is easier than ever with the Internet and our phones. These things that have become second-nature will fall if the Internet goes down. The Internet is an informative and vital tool. It is the source and form of information for billions. Not only does it serve to keep the global community up to date with world events at a swift rate, but it also serves as a worldwide platform built for interactive communication. From research papers to just reading the news, the Internet has the capacity to hand us information within seconds. Google Search takes literally less than one second to give you results that can number within the millions. To localize the impact the Internet has on our access of information, look at our own Oviatt library. Books have become searchable online to check for their availability and location. Some texts have even become an online-only text and online resources from other libraries can be pulled by the Oviatt for us to use. On a global scale, the spread of information has led to various uprisings throughout the world. Just look at Julian Assange, founder of Wikileaks. Wikileaks was able to release over 700,000 documents of classified United States military proceedings. One of the documents included a video in which US soldiers shoot suspected Iraqi rebels from a helicopter. The leak caused to the US Military to review the video. The Internet spreads word of injustices that happen all around the world. Take the situations happening in Syria, Venezuela and Ukraine. Without the Internet allowing for citizens within those nations to pass information, the world wouldn’t have much knowledge as to what’s really going on. To a large degree, the Arab Spring revolutions throughout the Middle East and parts of North Africa wouldn’t have gained momentum without the Internet. The revolutionaries during the Arab Spring used social media to organize their communities, and thus inform and mobilize the global community to help support these revolutions. While we support the belief that the Internet should become a human right, there are dangers if governments worldwide were to take control of the Internet. Making the Internet a human right should not make it a public resource. The physical infrastructure such as cell towers and wiring already laid out by independent companies as well as technical developments are vital in advancing our understanding of what we’re capable of on the web. If the Internet becomes a government utility without competition, it risks stagnation. Having a market of competitive providers keeps rates reasonable and technology fluid, which could prove beneficial as entrepreneurial companies expand into less-connected areas. Keeping Internet connectivity diversified, as opposed to the way our water is handled, also ensures that no one has definitive control over access and available content. This is essential when issues like censorship and privacy come into play. For example, during Egypt’s revolution, the internet was censored by the government in order to suppress information and quell the uprisings. Instead of becoming the source of public Internet access, governments should strive to become a hub for them by brokering contracts and working with private providers to create a public network. There should be regulations on the providers to ensure a diverse market, but not much government interference beyond that. Providers seeking to win public favor would then have to continue to improve their product, theoretically improving the options available to consumers. As of now, the Internet is a privilege. About two billion people have access to the net, according to the Internet World Stats. However there will come a time where the Internet will become a right. The Internet is changing our society, and has the potential to bring even greater change to this world. For a more in-depth editorial about the internet, listen to the podcast below with Podcast Editor Victor Frost, Assistant Arts and Entertainment Editor Taylor Villescas, News Editor Alex Vejar, and Production Staff Member Yoscy Perez.